There will be no Sonics practice this Wednesday, April 4 at Westbury High School. The rest of this week’s practices at Klein High and Sharpstown High will be unchanged. Sonics Wednesday practice, April 20, at Klein High has been cancelled due to continued rain and commuting difficulties around the north side of the city. South side practice tonight at Westbury High is tentative at this time. If you are considering coming out to run, please contact Coach Tim Woods (281-658-7405) to confirm before heading over there. 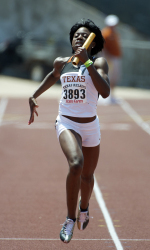 Former Sonics athlete and current Texas Longhorn track star, Christy Udoh, recently placed 3rd in the Women’s 200 meter dash at Nigeria’s national track and field championships, thereby earning her spot on their Olympic team. Before signing with the University of Texas, Christy ran for Westbury High School in Houston.